The ninth annual Downtown Food & Wine Fest will take place in downtown Orlando at Lake Eola Park the weekend of February 25 and 26, 2017. The two-day fest features mouth-watering dishes from some of Orlando’s premier restaurants, as well as domestic and international wines to sample. As part of this spring’s Food and Wine Festival, Busch Gardens Tampa has booked a great line-up of musicians to entertain during the event, which runs weekends in March and April. Universal Orlando Resort comes alive this spring with its annual Mardi Gras celebration, featuring 20 nights of concerts from the biggest names in music, starting February 8, 2014. On select nights through May 31, guests will experience a “N’awlins”-inspired, family-friendly version of Mardi Gras at Universal Studios Florida. There will be Cajun cuisine, authentic New Orleans bands, and an evening parade, all capped off with a concert by a headlining act. All rides will be operational, too. Universal Mardi Gras is included with regular admission, and annual passes. 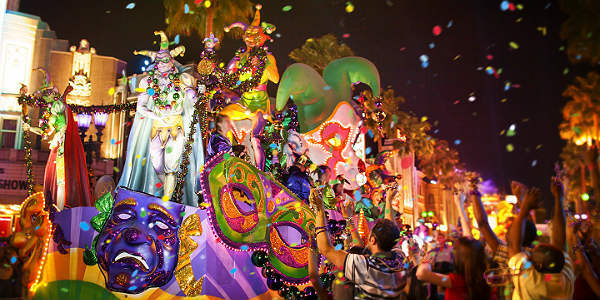 There is also a special Florida Resident Mardi Gras ticket for $69.99, that is good for admission after 5pm. For more information or to purchase tickets, visit UniversalOrlando.com. 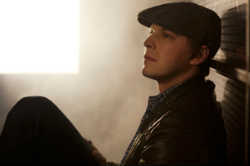 Universal Orlando has released the complete line-up of performers for their 2013 Summer Concert Series. Access to all Summer Concert Series performances is included with regular admission to Universal Studios Florida. For guests wanting to visit solely for the concerts, Universal Orlando will offer a special ticket providing one-time access to Universal Studios Florida after 7 p.m. The “Summer Concert Ticket” is priced at $69.99 plus tax and will go on sale beginning May 16 only at universalorlando.com. I’ve always told my friends that I thought Orlando was a place that needed a huge rock festival. Oh, sure, we have the Florida Music Festival, which is great for checking out a bunch of indie and local musicians. And we do get traveling shows like the Warped Tour that roll on through. But we’ve never really had an event on par with Coachella or Lollapalooza…until now. In a press conference today, July 21, 2011, Melvin Benn, CEO of Festival Republic, stood with Orlando mayor Buddy Dyer and announced Orlando Calling, a two-day music festival to be held on the grounds of the Florida Citrus Bowl. You may never have heard of Festival Republic, but they’re no fly-by-night company. As the company behind the hugely successful European festivals like Glastonbury and Reading in the UK, they have the experience and connections to make this happen. 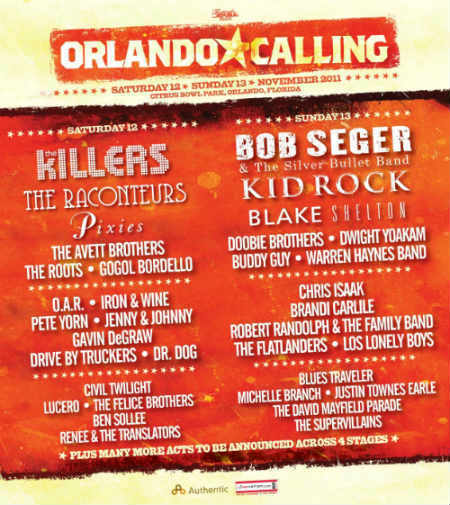 Orlando Calling will be held over the weekend of November 12 & 13, 2011. It will feature four stages each day of big name talent like The Killers, The Raconteurs, Pixies, The Roots, Bob Seger & the Silver Bullet Band, Kid Rock, Blake Shelton and more. The full listing (as of now) can be seen in the poster to the right. Tickets are rather reasonable for this fest. If you buy prior to September 01, 2011, regular tickets are $80 per day or $145 per weekend pass. VIP tickets, which include the admission plus a VIP area, unlimited beverages and more, start at $165 per day or $285 for the weekend. After September 01, the prices go up about $20 per ticket option. For more information on the fest, visit the website at OrlandoCalling.com.